Over the past few years I’ve noticed a few things about how I use my technology. Although the majority of the devices I own bare the markings of a certain California based fruit company (no not Apricot for you old-timers like me out there) the software I use has a distinctly Googly flavour. Gmail handles my communication, Google calendar attempts to bring order to my chaos, I write the articles that feed my family on Google Drive, Google Search aids my research, Google Maps help me get where I’m going, and Google + is fast becoming my preferred destination for social networking. If only the company made devices. Well, actually, it kind of does now. 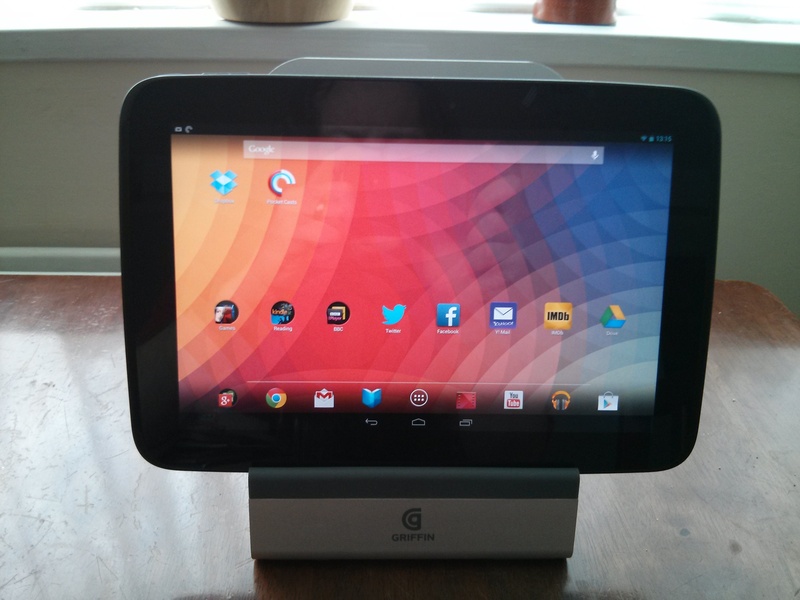 With the current range of Nexus devices we have tablets and phones that are intended to show us the mobile world as Google thinks it should be, and Chrome OS running on Chromebooks showcase how this translates to a full blown desktop operating system (stop that sniggering at the back!). So I thought, well, why not try living with them? Not piecemeal, but entirely. I already have a Chromebook, which has proven itself over several months to be an excellent writing machine, and the Nexus 7 joined our family at Christmas. So it wouldn’t take much to skip over to the green fields of Android and complete the lineup. 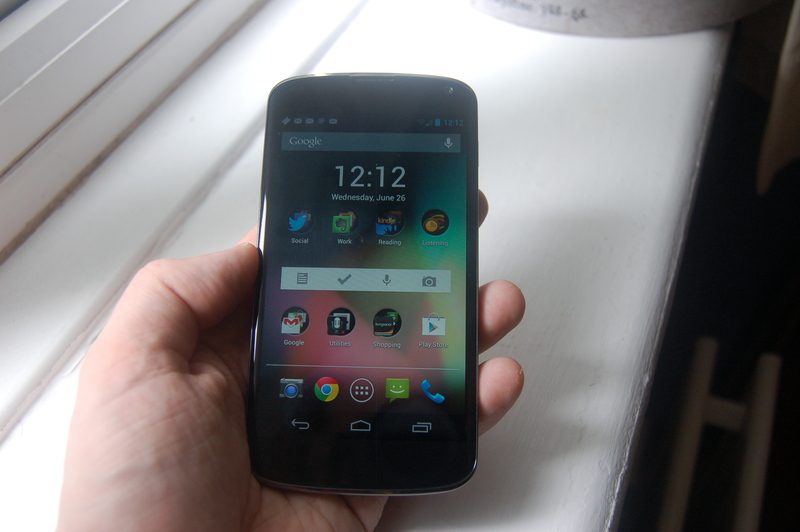 Armed with my univendor flavoured scheme I made a call to Google UK, who took pity on this impoverished freelance tech writer and agreed to loan me a Nexus 4 phone and Nexus 10 tablet for two weeks, possibly out of interest in my findings, but mainly to stop me calling them again. And here I am. Nervous? Yep, just a little. My iPhone 4S has been de-simmed and placed carefully in a dark draw, not to see the light of Facebook again for 14 days. The iPad 4 which accompanies me pretty much everywhere I go has been surgically removed from my hands, leaving the phantom tingles of a once present limb in its wake. Now I am in the company of strangers. The Nexus 4 will be my phone, the Nexus 7 my Kindle and handy sidekick, while the Nexus 10 takes on the challenges of the heavy duty tablet assignments. The Mr T of this technological A-Team if you will. Ensuring all the lovely plans come together is my Samsung Chromebook – you know, the really cheap one that I think is pretty damn wonderful. Are you an experienced Nexus user? If so what apps should I be running? I’ve already downloaded the standards – Kindle, Dropbox, Facebook, Twitter, Evernote, Wunderlist, Pulse and Audible, but are there others that make life on a Nexus device a glorious thing? Let me know in the comments below, and please feel free to ask any questions or offer suggestions on things I can try while exploring the world of Google living. The Chrome-book Pixel : Is this my next? Regular readers will know that I’m a fan of Chromebooks. Some may find the idea of a machine which exists primarily on the internet and can’t install software such as iTunes or Photoshop to be a bit of a non-starter. But for users like me who do nearly everything online, Google’s Chrome OS machines are uncomplicated, reliable, and just very pleasant to use. When I reviewed the Series 3 Chromebook a few months ago I was immediately smitten by its diminutive build, light weight, snappy performance and excellent keyboard. It instantly became my go to laptop and has remained so up until a couple of weeks ago when I was sent a Macbook Air 13″ for a feature I was writing. Now with the Macbook departing, and my need for a new machine becoming more pressing, I’m left with the decision of what eco-system to buy into, as you don’t simply get a laptop anymore. Apple have built some excellent machines but you can’t fix them yourselves. When you also include the necessary upgrades that mean you can keep them running well for four to five years the price gets pretty hairy. I’ve been reviewing a Windows 8 laptop for the past week, and I’m looking forward to them taking it away. So no sale there. If there’s one thing that holds me back on the Chromebook itself as a main machine it’s that the screen is a little underwhelming. Not terrible by any means, but not amazing. Plus I know that the mobile grade CPU will probably struggle to keep up with the ever advancing HD net that we now populate. As a second machine of course, or a family laptop, it’s absolutely perfect. Plus it’s very, very cheap. Nice. Then Google did something crazy. 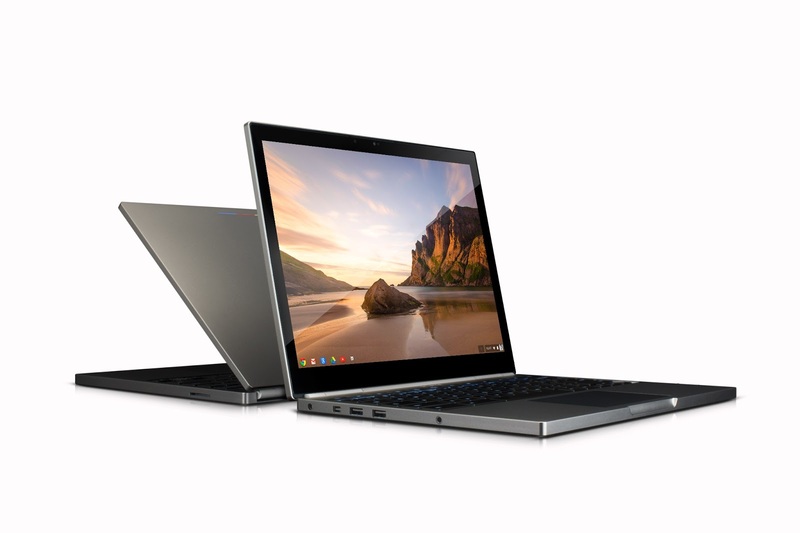 They announced yesterday the Chromebook Pixel. This new flagship is a £1000+ premium laptop, sporting a better than retina touchscreen display, and beautiful, industrial styling that stands out from the ever increasing sea of Macbooks I see in coffee shops every day. Plastic has been replaced with brushed metal, frosty screens make way for 3:2 aspect ratio HD displays purpose built for the way websites are laid out, and a stonking 1TB of Google Drive storage means your data can be free from the confines of an internal hard disk. I’ve long thought that if Google ever made a Macbook Air quality Chromebook and charged a decent price for it that I’d sign up in a heart beat. I like the way Chrome OS functions and have been dithering about committing to a new Mac for several months. So does the new Pixel fit the bill? I’m not so sure. Having come fresh from my Windows 8 touchscreen experience I’m more convinced than ever that I really don’t want a hybrid device. Maybe Google’s implementation will be different, but when using the Lenovo Yoga 13 recently I found reaching out to select things on a screen to be a rather odd movement. I’d much rather use my iPad or Nexus 7 for such tactile duties. There’s also the annoyance of having to clean your screen constantly, and wiping a laptop up and down on your t-shirt is a bit tricky. Then there’s the cost. One of the huge selling points of the series 3 Chromebook was the £229 price tag. For that you got 100 GB of Google Drive storage, a great little machine, and the assurance that if it started to creak after a couple of years you could replace it with a similarly affordable newer model. The Pixel currently retails for £1049, which isn’t crazy for a retina screen laptop, but last week Apple dropped the cost of their 13″ Macbook Pro Retina by a couple of hundred pounds to £1249, queering the pitch somewhat for a prospective Pixel customer. Then there’s the question of whether Chrome OS is really ready to compete in the premium marketplace. The Chrome store is growing very fast, and there are many great apps available – take note Windows 8 – so you can actually do a decent amount of work related tasks. But when you pay north of a grand for hardware you begin to expect to do everything. Photo-editing is achievable through a few decent apps, and basic video editing facilities are available, but they don’t quite match up to the iLife suite that accompanies every new Mac. Audio creation is also a bit of a challenge, so if you’re the creative type then you might find the Chromebook limited in these areas. Even writers like myself, whose needs are generally undemanding on machines, lack mainstream apps such as Scrivener or Celtx – although the latter does have a web portal. In the end it comes down to whether you want an ultra high class screen on your laptop, eschew the Apple or Microsoft eco-systems, and spend most of your life online. Are there many of those people around? Time will tell, but I must admit that even with all these caveats I still find myself sorely tempted by the Pixel. 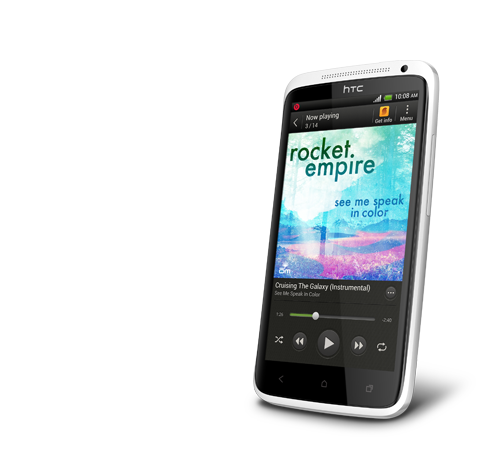 Living with the…HTC One X. The mobile phone industry is the ultimate in ‘shiny things’ thinking. No sooner have you bought a device, usually via an expensive ongoing contract, and learned to master the complexities of the modern smartphone with its many splendours, then your contract is heading towards renewal. Your provider then entices you with another, sleeker, lighter, whizzbangier model to replace your now brick-like technological equivalent to a rusty lawnmower. Giddy with excitement at the impending device nirvana you sign a new contract and begin the whole sorry tale once more. Thus it ever was and ever thus shall be. Your mobile phone the day after your contract runs out. Last year I took the rather unusual step of not signing up for a contract when my old one matured. Instead I decided to buy a second hand phone, secure a cheap monthly contract which didn’t subsidise the costly device, and see how it would work out. The results have been, well, cool. 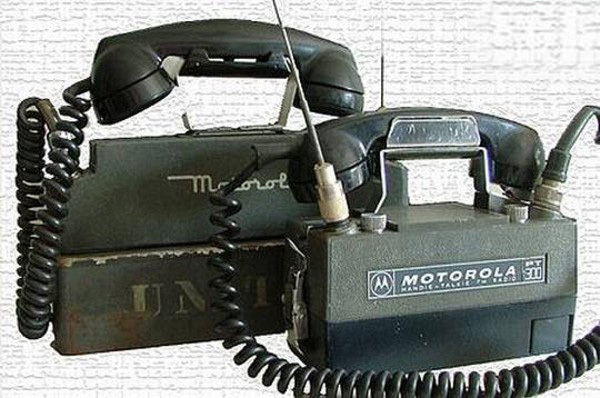 Rather than run the gauntlet of eBay I opted to pay the premium of an established S/H online store (replete with short warranty) in my search for a new handset. The iPhone 4S had recently become last year’s model so the 16GB version was available for £380. Now this is a hefty sum of course, but by avoiding the expensive monthly contract I worked out that over two years I could save around £300 – not too shabby – and of course that saving would then pay for the next phone. Suddenly I had become a financial genius. Next I plan to dabble in futures, derivatives, and no doubt impoverish my family. In the year or so since then I’ve enjoyed my iPhone and am very glad that I took this route. So much so that I’m doubtful I’ll ever go back to a subsidised plan again. This then opens up intriguing possibilities. As we all know smartphones have advanced so much in recent years that almost any decent model will do everything we need on a day to day basis without issue. So starting to shop in the S/H markets means you can get some very good units for a lot less than your contract would demand, and if you avoid the Apple models (with their premium price tag) you can even bag a real bargain. A quick perusal on http://www.smartfonestore.com (the site where I bought my iPhone) shows that you can pick up some terrific devices for great prices. 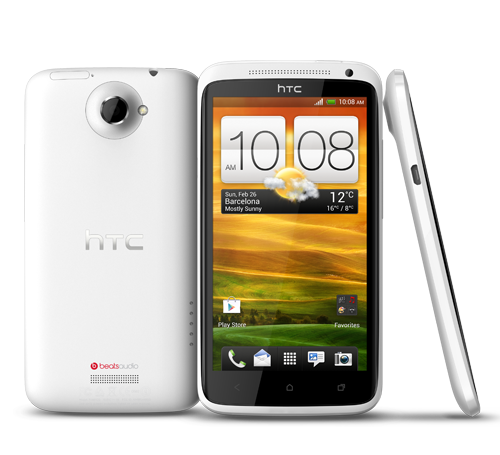 One that I was particularly interested in was the HTC One X, which had run the iPhone close last year and which could be bought now in mint condition for just over £200. 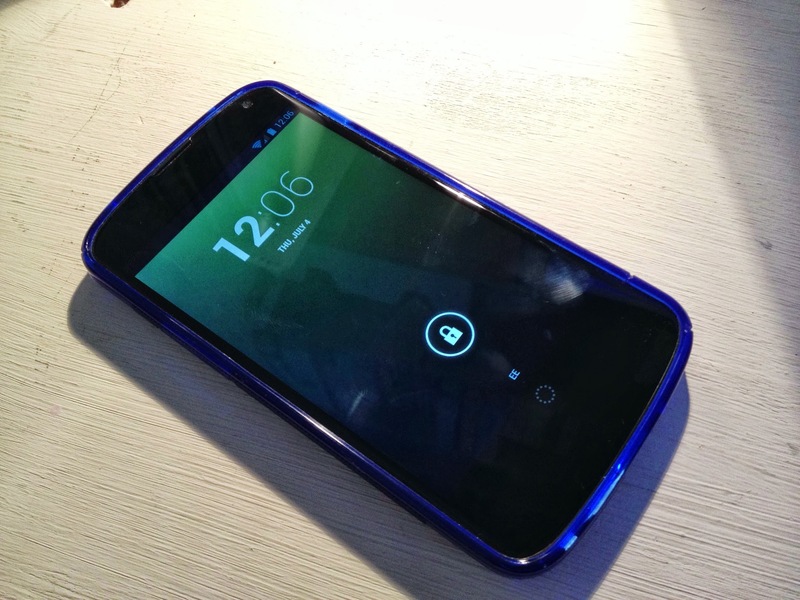 Thankfully HTC where willing to lend me one for a few weeks, thus saving me having to wipe out my savings in the interest of journalistic endeavour. So, the question was how does the One X fare a year and bit on from it’s release? Those used to the diminutive charms of the iPhone will notice straight away that the One X is a big phone, mainly due to the 4.7 inch screen. Now I’ve been rather skeptical of the current trend of devices that can double up as surf boards, and in many ways the One X did little to persuade me otherwise, but in some instances I can really see the appeal. Over the last year or so I’ve noticed that I don’t really watch Youtube videos on my iPhone. The reason for this is that the 3.5 inch screen just feels a bit too small for this activity. On the One X it suddenly made sense. HD videos looked superb and the impressive viewing angles meant sharing the experience with friends was far more likely than with my Apple alternative. The screen itself is gorgeous. Colourful, bright, and capacious, it made interacting with the handset a very pleasant experience. Typing is dramatically improved since my days on the HTC Desire, again probably aided by the generous acreage of space. But this expansive ocean of gorilla glass also meant that I had to adjust the positioning of the phone in my hand more than I ever do with the iPhone, and the usual habit of typing one handed while walking down the street was a much harder feat to achieve successfully. The Android operating system, which has been upgraded to 4.1.1 Jelly Bean, is smart, efficient, but still has the occasional lag, although much improved from previous incarnations. Android has come on leaps and bounds in the past couple of years, with plenty of the top apps such as Instagram, Kindle, Facebook, Twitter, Temple Run, and the ever gorgeous Google+ being present. Actually Google’s suite of apps (Maps, Youtube, Now, Voice Search, etc…) all look great and work brilliantly on the One X, meaning that most important tasks are now easily covered. There is still the delay in top apps reaching the platform though, so if you always want the latest and greatest then the iPhone still remains the place to be. I’d read on several forums that the battery life on the One X was a bit of a let down, but during the weeks of testing this was never an issue. With an average day including sending and receiving several emails, posting and checking social media sites, listening to an hour or two of podcasts, and even – heaven forbid! – the occasional phone call, the battery always had a bit left in the tank by the end of the day (which is often about 1am in my discipline void existence). If there was one area where the One X lost a few points it was the camera. Now for many things it’s perfectly fine, but when compared to the iPhone (which does pretty much always have one of the best cameras available) it lacked a bit of sharpness and focus at times. That said it would be totally acceptable for everyday use and you’d only notice the difference if you had an Apple device on hand to compare it to. That screen really is a bit special. So there it is. As the One X has now been superseded by the One X + you can expect the prices to continue to drop, which is great is you’re looking for a superb handset that offers cracking performance and will not cost you a small fortune. It might be getting long in the tooth when measured by the insane upgrade cycles that we now find ourselves terrorised with, but it’s still a terrific phone with plenty to offer. Let the eBay treasure hunt begin! For years now I’ve been one of those small minority that chose a different path. It meant investing financially and emotionally in an alternative to the mainstream, contenting my inner rebel with the knowledge that I was eschewing convention and embracing the fringe instead. For years I walked this line, until recently something changed. Where once I would smile inwardly when chancing upon someone else who held my beliefs, possibly in a coffee shop where both of us would be working behind the cool glow of our machines, now I find the proliferation of Macbook Airs and Pros somewhat disconcerting. In fact it’s almost a curious fascination when I see someone using a PC – a refreshing splash of black in the otherwise unrelenting sea of brushed aluminium. Shouldn’t this make me happy? After all it means that my choice of hardware is being vindicated. Well, possibly, but I have to admit that in a perverse way it actually makes me want to move away from the big fruit and find a new underdog to champion. I know. I’m an idiot. You don’t have to tell me, deep inside…I accept this. Before you leap to the conclusion that this is some kind of superiority thing, I can assure you that buying something expensive to differentiate myself from others has never been an option. Journalism is fun, but it really isn’t a well paid gig when you’re freelance. In fact one of my main reasons for switching to Macs in the first place wasn’t their premium brand status, rather it was the amount of keyboard shortcuts the OS employed (I was recovering from a bad RSI injury) and the fact that putting together a home video on my old PC felt like doing battle with an evil warlord whose magic was old and very deep. I purchased a refurbished iBook and set sail on the goodship Cupertino, very happy with this brave new world of computing. After a couple of years I upgraded to a shiny new Macbook, which proved a mighty workhorse, until a few months ago when age finally began to catch up with it. Now I stand on an ethical precipice. 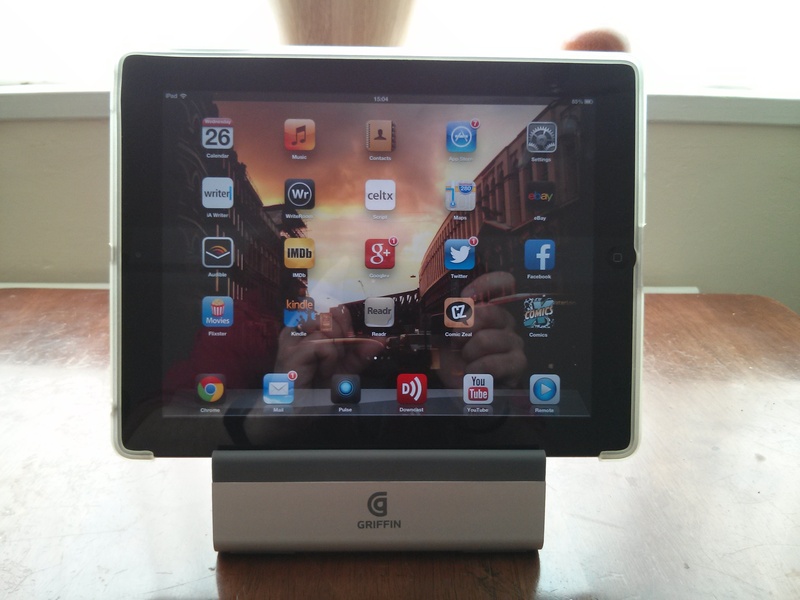 Do I replace my faithful servant with a newer model or make the leap to another platform? As we’ve already established, it’s because I’m an idiot. Macs are great. They’re stable, fast, very pleasurable to use, and the iLife suite really is worth buying the machines for alone. The problem I’m having is that whereas in the past I felt like I was part of some kind of counter-culture, mainly due to the tiny sales figures of Apple machines compared with Windows machines, now Apple laptops almost seem the norm. I love my iPad, it’s a constant companion, yet in my heart I find myself yearning for a viable alternative. I bought an iPhone last year for the first time – it’s great. The battery life is amazing, the camera is incredible, and the damn thing just works. So is it some kind of perverse logic, or subconscious desire to bring pain upon myself, that I am even considering a leap into the unknown? Yes, that’s probably it. Well, some of it. The thing is, to me, Apple products are still the best that (lots) of money can buy, but when you don’t have lots of money washing around your bank account the need for value becomes a more sharpened sword. I don’t want to buy a product that has a built in redundancy due to the low RAM allocation or curiously under powered hard drive. I don’t want to have to pay all my upgrade costs up front, rather than spread them across the years of ownership due to devices that can’t be opened by customers. At the heart of it though, if I’m honest, I just don’t want to buy something sensible. When Apple released the original iMac one of the things that immediately caught my eye was the range of colours. Previously I had bemoaned the lack of spark that the relentless procession of beige boxed PCs had wrought upon the computer landscape. Now there was this spectrum of hope that put the fun back into using devices that, I believe, are still the greatest creative tools ever invented. Skip forward twenty odd years and this visual splendour has been replaced with the cold, stark silver of brushed aluminium. What happened? Did Steve Jobs get offered a job-lot of the stuff cheap from the digital community’s equivalent of Derek Trotter? Where once there was colour and rebellion, instead we find uniformity and stock dividends. So my quandary is such – I love OSX, have always found Apple laptops to be perfect for me, and over the years I’ve invested in various pieces of software that only run on the fruit flavour of machines. But the excitement of being part the alternative has slowly ebbed away as success has transformed the perception (and choices) of Apple. Strangely I feel more of a corporate customer than I ever thought possible. When Steve Jobs famously gave his ‘Stay hungry, stay foolish’ speech at Stanford I wonder if it ever occurred to him that his own company would have need of this wisdom in the coming years? Ever since Google announced their first Chromebook laptops back in 2011 I’ve been fascinated by the idea. Computers that eschew the storage of data locally, but instead embrace the cloud in all its metaphorical glory. The idea makes sense to me, is workable for me, in fact it’s actually preferable to me. The only problem is that the hardware up until now has been, well, rubbish. 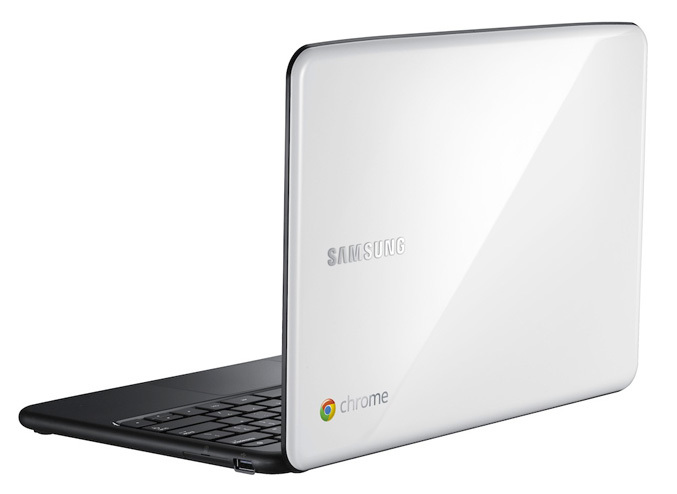 Samsung’s first Chromebook attempt. Naughty Samsung! I had the chance to road-test Samsung’s initial Series 5 offering , and although I could see the potential in the system there was an undeniable lack of build quality or speed in that machine. Not the best way to promote a concept that many people still maintain as kind of pointless. If you’ve never used a Chromebook, or indeed haven’t even heard of them before now, then they might sound a little odd. Essentially they are computers that do pretty much everything online. 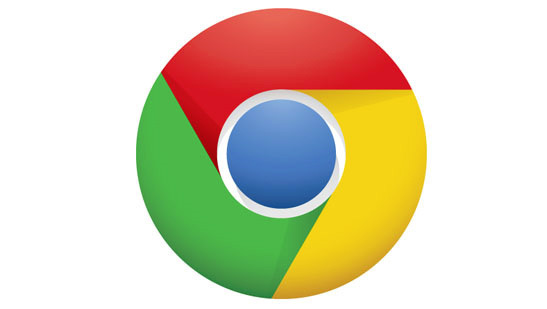 Most of us are familiar with Google Chrome, which has grown in popularity over the past few years to become one of the world’s most used browsers. The Chromebook does everything through Chrome, making the laptop similar to the old fashioned terminals that used to access mainframes in the 90s. All your data is stored online, as are the programs you run. This means you can’t lose your valuable thesis or family photos if you accidentally run over your laptop with a tractor – a very common complaint – as the information is safely nestling in the warm bosom of Google who, let’s be honest, are far more likely to perform regular backups than we are. This also means that you are free to log into your Google account from any computer, work on any project you like, then when you return to the Chromebook all the changes will be included. But Sir! You cry. Surely any computer with a browser can do this, and a lot more besides? The difference of a Chromebook is that it doesn’t run an OS like Windows or OSX, so it can’t get viruses. It also means that if someone steals your machine, or you upgrade to a newer model, all you need to do is log into your Google account and within a minute everything is there. No backups, or re-installing software, simple, and of course the information is constantly backed up by Google. One real advantage, which myself and my wife have found invaluable, is that you can log in with various accounts, each with the relevant apps and documents attached. Of course laptops can also do this, but the Chromebook just feels very natural working this way as everything is online. For people who use specific software packages to accomplish tasks – say Photoshop or Final Cut Pro – then the Chromebook is a non starter. But for most of us who use their laptop to browse, email, interact with social networks, or do a spot of writing, then the story is quite different. In the past the real Achilles heel of the idea has been that once you find yourself without a WiFi signal the computer becomes a rather large waste of space, but Google have been updating the OS carefully and it now includes the ability to work on documents offline, which then sync up automatically to the online versions once you find a signal again. The whole thing is seamless and removes one of the last fears that many of us enthusiasts have had. Google’s little beach ball of happiness. All this talk is nothing but pretty words arranged in spectacular fashion unless there is a worthy product in the end. Now, thankfully, one has arrived. 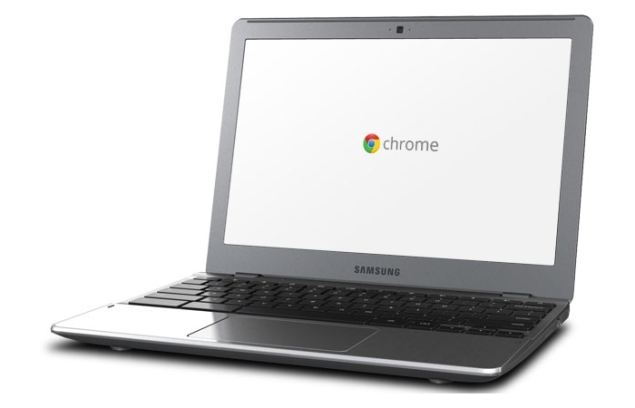 The Samsung Chromebook (2012) is the latest machine from the electronics giants, and with this one they have finally got it right. In recent months there have been Chromebooks that cost the best part of £400 but still feel like budget machines. In fact I’ve often thought that if you want to charge that much for a low powered, limited, machine then it had better be built like a Macbook Air – which of course it very much wasn’t. Now the new machine is built like a cheap imitation of a Macbook Air, priced accordingly, and I love it. Don’t let any carefully shot promotional images fool you into thinking that this Chromebook has any Apple style brushed aluminium about its small body, it’s plastic through and through. This makes it light and enables Samsung to charge £229 – both of which I heartily approve of. 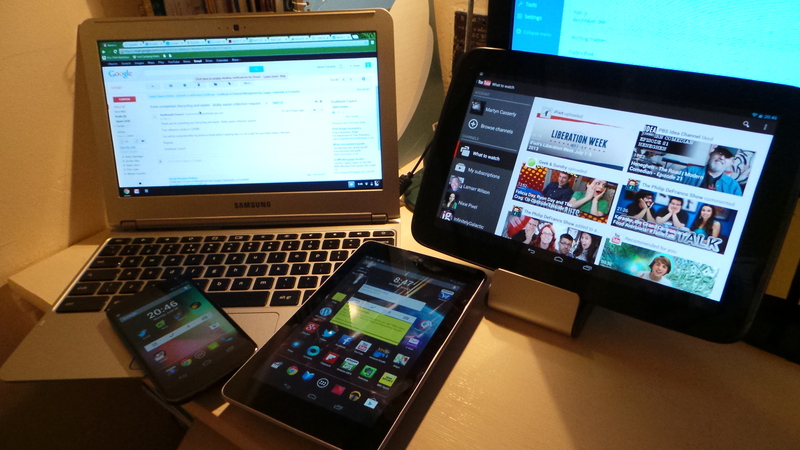 Google have been clever in marketing the machine as your ‘other’ rather than main device. Let the kids play with it, welcome your butter fingered auntie back into the technological fold once more, even take it on holiday to Afghanistan with little hesitation. Ah, glory be! The age of disposable computers has finally arrived. The new Chromebook. Take a bow Samsung, take a bow. All this sounds a little derogatory, and it is, because strangely enough the Chromebook is actually a great little machine with a surprisingly fabulous keyboard. It didn’t take long for the diminutive laptop to find a special place in my heart, and thanks to the fact that I already use Google Docs for my work, and web-based services for nearly everything else, I’ve not felt restricted by its online nature at all. Yes the screen is a little frosty looking, and you need to wait a moment or two for webpages to load before you can scroll through them, but these are small gripes when you factor in the cost and the pleasure the machine is to use. Actually if the truth be told I use it rather less now because my wife keeps stealing it away for herself, which I can assure you is about as high a praise as can be given to a device. Of course I don’t expect the machine to last for years, but that becomes less of an issue when the price is so low and the knowledge that a replacement will feature identical data once you log in. In fact I was heavily considering a Macbook Air to replace my ageing Macbook, but now I’ve used the Chromebook I can’t justify paying out £1100 just to be able to do a few more things on a much prettier machine. Instead I shall save the money and beef up the desktop I have at home, and maybe invest in a decent iPod dock with the change. Yep this little machine is the gift that keeps on giving. The Google Chromebook is the ultrabook for the rest of us, and I’m well and truly smitten. If you want to see an in depth evaluation of the machine then please visit the review here that I wrote for PC Advisor magazine in November 2012. The recent London Olympic games had many poignant moments, but one in particular stood out for those with a keen interest in technology. During the opening ceremony Sir Tim Berners-Lee, inventor of the world wide web, tweeted a message from the mainstage which was then displayed in huge letters all around the stadium. It simply read ‘This is for Everyone’, and was a reminder of how important the modern internet has become to all of us. It’s a concern then that in the past few years a political storm has been brewing about the future of the web, or more precisely how we gain access to it. The argument centres around the principle of ‘Net Neutrality’, and looks set to become one of the most important debates in technology for the foreseeable future. Tim Wu – Professor at Columbia Law School, author of the book ‘The Master Switch’, and the man who coined the phrase Net Neutrality – recently stated in an interview that ‘The internet was built on the principle that the carriers take your data where you want it to go, and that people are allowed to communicate over the internet without interference from the people in the middle. It’s a pretty profound principle’. This is the essence of Net Neutrality. The fact that the companies that supply you with your gateway to the internet remain neutral to the content and sites that you visit, treating all as equal. 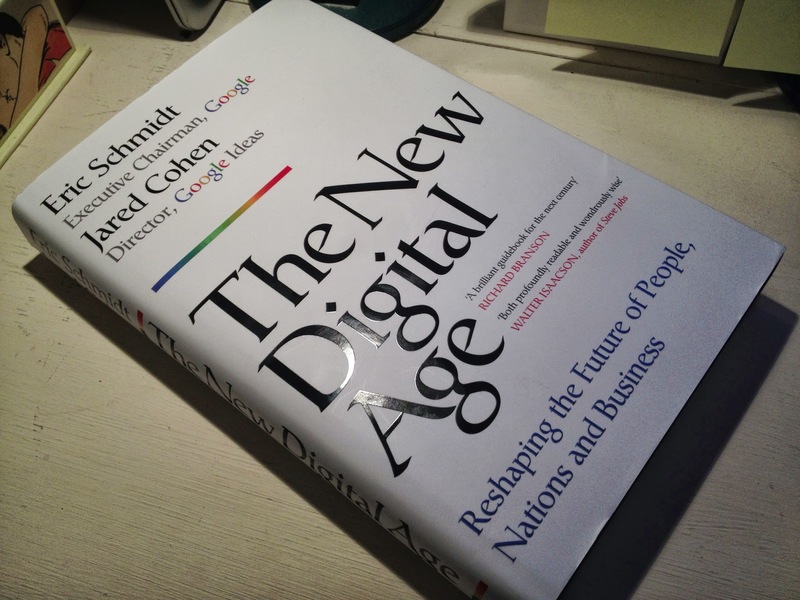 It’s obvious, sensible, and exactly how the internet has essentially functioned up until now. But as we increase the amount of data we consume, due to services like Youtube and BBC iPlayer, some ISPs are beginning to talk about charging more to carry this content, or at least to ensure that the quality of its delivery remains high. It can be easy to forget that the way we access the web is still controlled by only a few companies – those with the physical infrastructure that allows signals to pass between two points. This gives those companies a tremendous amount of power as our reliance on the internet increases. How would you feel if your provider decided that to access some of the more popular online sites you would be required to pay them more? You want Facebook as part of your package, then that’ll be an extra £5 a month. Youtube? £10. It might sound far fetched but there is growing concern that this behaviour could be on the horizon unless governments decide that Net Neutrality becomes enshrined in law. 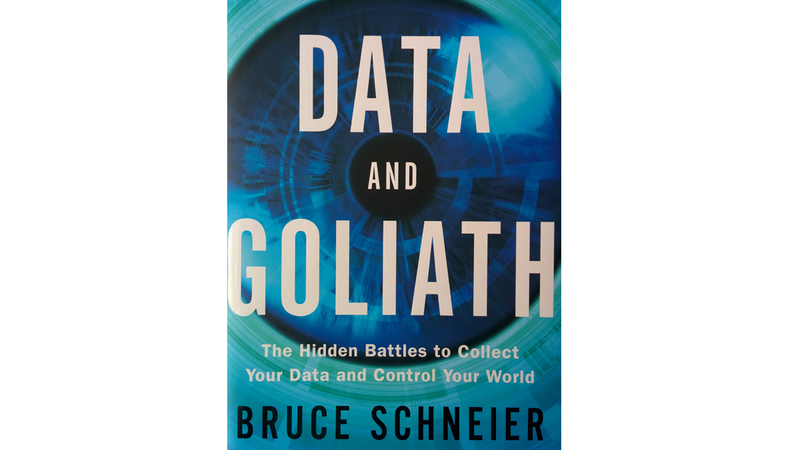 It isn’t just a simple case of the amount of data we consume, that would seem reasonable, instead it’s more a case of where or from whom we receive it. Recently customers who bought an iPhone 5 on the AT&T network in the US were told that they wouldn’t be allowed to use the built in Facetime feature over their 3G service, even though it should come under the customers’ data plan. AT&T were basically telling their customers that they could only use the data which they were paying for in a manner that the company would decide. We’ve seen something similar here in the UK were several of the mobile carriers have disabled the Skype service on their networks, and also deny customers the option of tethering their laptops or tablets to their mobile phones to create internet hotspots. This selective attitude towards allowable services could theoretically be used to promote rival services with whom the carriers have favourable agreements. Media reform advocacy groups such Free Press (freepress.net), who started the Save The Internet campaign (savetheinternet.com), voice a chilling version of the future when they argue that the ISPs, and media companies that back them, ‘want to tax content providers to guarantee speedy delivery of their data. And they want to discriminate in favor of their own apps, services and content — while slowing down or blocking competitors’ services.’ This might sound like classic scaremongering, but it should be noted that back in 2005 AT&T caused outrage when it proposed charging certain web companies increased rates so they could receive preferential treatment for their web traffic. This would have effectively given the paying sites faster download speeds than their non-paying rivals, and made AT&T a tidy profit from this two-tiered approach. Then in 2007 Comcast, the largest cable TV and internet provider in the US, was found to be tampering with traffic across their network to certain file sharing sites in an attempt to make them unusable. In fact a recent joint study between the Body of European Regulators for Electronic Communications (BEREC) and the European Commission found that at least 20% of mobile Internet users in Europe ‘have contracts that allow their Internet service provider (ISP) to restrict services like VOIP (e.g. Skype) or peer-to-peer file sharing.’ while the same was true for home broadband connections, especially in regards to peer-to-peer sites at peak times. 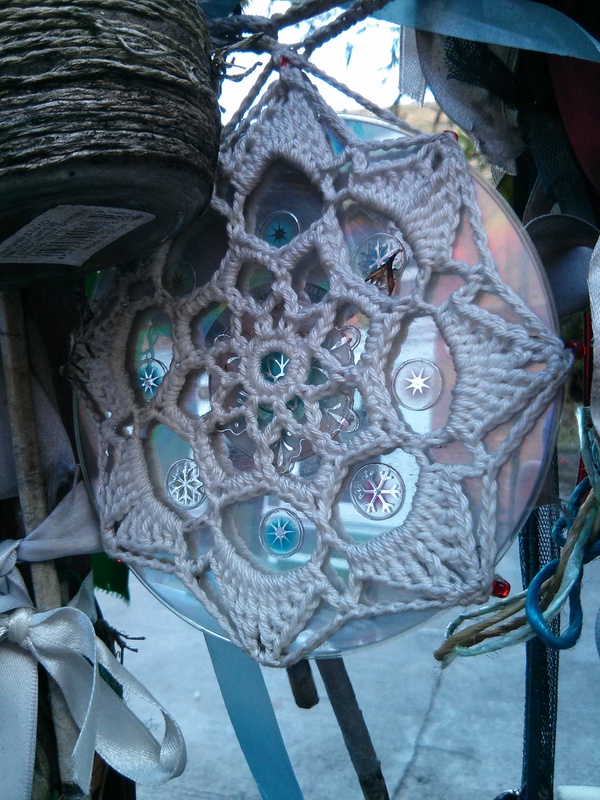 The main concern that advocates argue is one where the internet as we know it becomes more of a series of walled gardens where access is strictly controlled and regulated by a few large corporations each of whom offer their own services and media – almost a return to the days of AOL and Compuserve, with customers locked-in to their specific version of the web. ‘Big media companies want to be in charge again,’ states Tim Wu, ‘Most of the media for the last 150 years have been closed, that is if you look at NBC, or you look at the cable networks – they decide what goes on the network. So the threat comes from the fact that the broadcasters, phone companies, cable [companies], are used to that business model and want to go back’. In 2012 the SOPA, PIPA, and ACTA bills were proposed in the US and Europe as a way of curtailing content on the web under the auspice of copyright protection. If passed they would have forced ISPs to regulate the content that went through their networks, which could have resulted in sites being delisted from search results, thus virtually disappearing from the internet, if the ISPs thought there was a possibility that they contained copyright material. The bills were defeated in their respective countries after widespread discontent from the online community, but the entertainment industry is thought to be preparing new ones, and their lobbying power means that they will certainly be heard. The political level of involvement in the issue saw Holland become the first European country to make it law that no ISP can charge more for access to specific sites, while Chile has also created relevant legislation. The concern about Net Neutrality became so great that even President Obama spoke about it in a 2010 interview, during which he said ‘We’ve got to keep the internet open, we don’t want to create a bunch of gateways that prevent someone who doesn’t have a lot of money but has a good idea from being able to start their next Youtube, or their next Google on the internet’. The battlelines are being drawn, and it looks like this is an issue that’s set to be hard fought over the next few years, and which could decide our online experience for decades to come. A version of this post originally appeared as part of a new series of features called News Viewpoint that I write for the PC Advisor website and also appears in the February 2013 issue of the print magazine – yes, I know that’s in the future, but the way magazines work is a mysterious form of sorcery. To see the original click HERE or pop out to your local newsagent and purchase the rather splendid magazine itself.